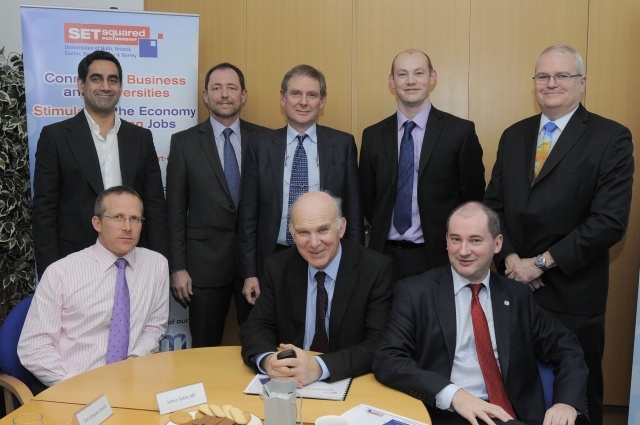 Business Secretary Vince Cable is the latest high-profile figure to visit the University of Bristol’s SETsquared business acceleration centre. The MP was keen to learn more about the city’s burgeoning technology sector and met five of the companies which have benefited from the support offered at SETsquared. His visit follows on from HRH Duke of York, who gave the centre his royal seal of approval in October, and other influential parties including Lib Dem leader Nick Clegg, plus Labour ministers Liam Byrne and Jim Knight. Mr Cable was in Bristol with Deputy Prime Minister Nick Clegg for the West of England Manufacturing Summit, held at the Bristol and Bath Science Park, but also wanted to see what initiatives the city has in place to help businesses grow and become sustainable. Stephen Williams, MP for Bristol West, joined him to meet the brains behind some of the innovative companies at SETsquared, which has helped start-up businesses gain the support and funding they need to become a global player. Nick Sturge, Director of the Bristol SETsquared Centre, said: “Vince and Stephen had heard about the work SETsquared is doing to support entrepreneurs in high-tech businesses and was keen to find out more. He met five of our 55 companies, at various stages of development, and heard how we’ve helped them grow and develop. David Sykes has spent more than 25 years working in British and American high-growth start-ups, where he has held a variety of senior sales, marketing, and general management roles – including positions on several company boards. This has given him considerable experience in all aspects of starting-up, growing and managing new ventures, from inception through to flotation. David is now a seasoned SETsquared Mentor and non-exec to a number of technology companies in the West of England. Paralant, founded by technologists Neil Hickey and Dr Phil Power, is developing a suite of products targeting novice and experienced software engineers. Paralant’s solution allows software to efficiently target current and future hardware platforms from a single source base, providing a competitive advantage and increasing time to market for an optimal and scalable solution. The Bristol-based technology company, established by Andy Heaton, focuses on home energy management. It has received $1.6m in funding from Andromeda Capital to complete the development of its ground-breaking technology and web services. The enModus solution is built around Wattwave – a powerline communications technology that has been developed specifically to meet the demands of the growing market for smarthome applications. Wattwave will power a range of retrofit and embeddable products, that offer unrivalled performance at a fraction of the cost of existing solutions. Coupled with an intuitive, engaging and fun user interface, enModus will offer homeowners the services they need to monitor and control all aspects of their home. Brightpearl was founded by serial entrepreneurs Chris Tanner and Andrew Mulvenna and is headed up by Silicon Valley veteran, Salman Malik. Brightpearl is a fully integrated, web-based business management software system which allows small businesses to run all their processes through one piece of software. All business data is in sync and available in real-time with complete visibility across all departments. Brightpearl includes CRM [Customer Relationship Management], accounting, inventory control, sales order processing, point of sale and ecommerce functionality including integration with marketplaces and webstores. Brightpearl is headquartered in Bristol employing 50 staff and has just opened an office in San Francisco to aid expansion into the US market.